The thesis of this volume is that of the moral value of the integration of conflicting desires. Desire is the source of value. Desire in itself is not bad, nor does the conflict of desire necessarily produce relativism. Conflicting desires create absolutisation and prevent us from addressing conditions. 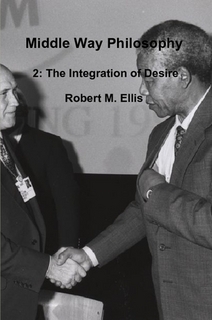 The integration of desire, through the practice of the Middle Way, produces incremental moral objectivity by enabling conditions to be addressed better. These theories are open to testing both in individual experience and empirically. However, clarity on the issue is in many ways more important than demonstration, given how readily demonstration can be found in everyday experience. This section is concerned with understanding our lack of essential unity, and thus proneness to conflicts of desire, at many different levels. There are conflicts of desire within our experience, but also unconsciously. We can also understand the conflicts within ourselves in terms of conflicts between different parts of our bodies and brains. Individual conflict also gets written large as group conflict, which can erupt into political and even violent forms. At all these different levels, it is important to simply recognise the conflict, rather than trying to categorise desires themselves as ‘rational’ or ‘irrational’, or privileging some desires as ‘values’. It is only by fully recognising our conflicts of desire that we can create the conditions for integrating them. Since desires remain conflicted and unintegrated due to the operation of the ego – our exclusive identification with desires dominant at a particular time – this integration of desires can also be described as integration of the ego. This section is concerned with clarifying broadly how integration can occur or not occur, and exactly what integration means in relation to the fulfilment of our desires. The concept of desire fulfilment is central to this section. Unlike the Buddhist tradition, I do not reject in principle the idea of a desire being fulfilled: but desires have to set their own terms for fulfilment in the way they are represented, and address the conditions required to reach their goals. Basically, this means that desires can only be fulfilled to the extent that they are integrated. Integration can in turn be understood as a set of conditions for the incremental fulfilment of desires. This section is concerned with the entrenched forces that prevent integration of desires. I describe these as ‘ideologies’ because they are sets of inter-related metaphysical beliefs widely shared within a group and perceived as supporting that group’s interests. They are ‘egoistic’ because they support the ego: that is, they help to maintain the belief that the desires we currently identify with are ‘our’ desires, and that they are thus absolute and non-negotiable. It is the dogmatism of ideologies that makes them egoistic. This section particularly traces the effects of alienation and repression from absolute beliefs in a range of ideologies. These include not only the positive beliefs that are outwardly opposed to common desires, but also the negative ones, like hedonism, that are in theory on the side of desire’s fulfilment. This section focuses on how we can actually integrate desires at the individual level. The methods we can use vary in directness, with meditation being the most direct, and attention to our longer-term relationships, environment, and mental states offering less direct approaches. All of these methods can be categorised in terms of the adapted Buddhist formula of the Four Exertions, which leads us to pay attention to both integrated and unintegrated desires, cultivating and maintaining the former and modifying or (when necessary) suppressing the latter. This section argues that the integration of desires is interdependent with that of meaning and belief, and is not the basis of a straightforward hierarchy. We do not need to deduce our understanding of integration from a belief in total integration as a final goal, but instead to think incrementally. In the process we need to recognise that integration of desire can take temporary forms (such as dhyana) with rapidly decaying long-term effect, and also that it can take asymmetrical forms, as we get integrated more in some ways than others. This section offers a political philosophy based on the application of the integration of desire to conflicts of power in society. Anarchism and pacifism are avoided as absolute positions that eschew all use of power, and it is suggested instead that the justification of the use of power depends on relative degrees of integration. This integration needs to be understood on the socio-political level not only in relation to the integration of individuals, but also that of groups in society, of government with the people, within government and between governments. Democracy provides one contingently helpful mechanism of integration, but it is the integration that it makes possible that justifies it. The thesis of this volume is illustrated here in relation to three individuals: myself, the Buddhist leader Sangharakshita and the British prime minister Margaret Thatcher. At group level it is also explored in relation to the history of the Ottoman Empire and of the conflict in Northern Ireland. This volume makes no claims to great originality, but synthesises various sources of information. Its purpose is to break down barriers between different perspectives, of which perhaps the most damaging is that between ethics and psychology.